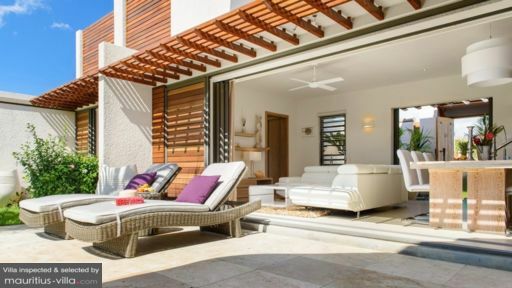 With sheer luxury that rivals even the most prestigious of hotels, Astrolabe Villa 2 is brimming with a wide variety of amenities and services that will help you enjoy the holiday of a lifetime in Mauritius. Located in the five-star Clos du Littoral complex, this villa has two bedrooms and can sleep four guests. An additional mattress can also be added at an extra fee for a fifth guest. An absolute haven of tranquility and serenity, this villa offers just about anything you might need to recharge your batteries and enjoy the pampering that you deserve. Overlooking the private garden, the Master Bedroom is fully air-conditioned to provide some much-needed respite from the tropical heat. This room is fitted with a massive bed, and crisp comfortable linen to ensure that you get a good night’s sleep. It also comes with a dressing area and a safe, ensuring that your valuables are entirely secure during your holiday. The Master Bedroom opens on an en-suite bathroom which has a shower, sink, mirror and toilet. At Astrolabe Villa 2, you will also find a guest bedroom to accommodate your kids or any friends you might have over. This particular room contains a double bed. Like the master bedroom, this room is also fully air-conditioned and includes a dressing area. It additionally has an en-suite bathroom with shower, toilet, sink and mirror. Nestled in the midst of abundant foliage, Astrolabe Villa 2 has a massive tropical garden that will titillate your senses with the wonderful aroma of island plants and flowers. Enjoy fun-filled evenings with friends as you gather in the gazebo and make the most out of the included barbecue equipment. During the day, you can also lounge on the sun beds and soak in the sunshine as you work on your tan. To cool off after a lazy tanning session, you can take a plunge into the massive 3.7m x 6m swimming pool which is illuminated at night. The living area at Astrolabe Villa 2 is designed for peace and relaxation. As a result, you will find a spacious living room, complete with ceiling fan, L-shaped sofa, coffee table and flat-screen television. The dining room can seat between six to eight people and overlooks the pool area. Because you will be responsible for your own meals, the kitchen also comes with a fridge, cupboards, microwave, gas stove and other such appliance as well as utensils that you might require. Several kinds of services have been put at your disposal to ensure a restful and stress-free vacation. Upon your arrival, for example, our guest relations officer will welcome you to the villa with refreshing towels, cocktails and a welcome pack including toilet paper, trash bags, fruit platter, coffee and tea, pepper, salt and sugar shakers, shampoo, soap and shower gel, among others. A daily maid service is also offered to take care of the laundry, ironing, cleaning and general housekeeping tasks. Please note that ironing is subjected to conditions. Every morning, you will be treated to a daily continental breakfast hamper full off delectable goodies such as fruit juice, one pastry per person, jams, coffee and tea. It is possible to opt for supplements such as bacon, eggs and sausages. Guests at Astrolabe Villa 2 can also choose from a variety of A la Carte services such as In-House Chef, Maid Cooking, Excursions, Babysitting, Grocery Delivery, Car Rental, Airport Transfer, Extra Beds or Half-Board Supplements, among others. 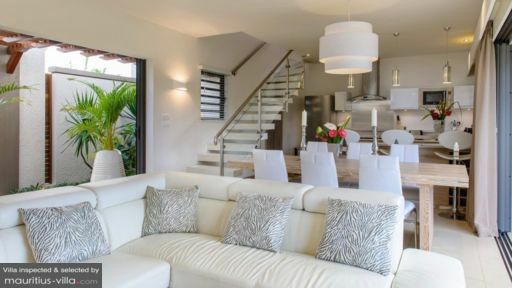 The villa is perfectly located near Grand Bay, the main tourist village of Mauritius. It is also forty-five minutes away from the island’s capital of Port Louis, the best place to indulge in some retail therapy. Indeed, this city contains just about everything you might need such as local street food, street vendors or even high-street brands. If you want to enjoy the sun-kissed Mauritian beaches, head over to Peyrebere, a charming coastal village found just after Grand Bay. There, the sand is fine and white, and you might even spot the famous local sand sculptor who delights tourists with a different intricate sculpture each day.